Whether it's a feature article, short blog post, product announcement, review or copy for a website contact page, writing is about connecting with others. Jacinta Plucinski is a writer, storyteller, producer and publisher with over 20 years experience in online, digital and print media. She's worked with large corporations such as Google, Discovery Channel and Australian Centre for Moving Image (ACMI) as well as museums, newspapers and startups - her own and others. She's interviewed politicians and business leaders across the globe, written short and long form features, travel essays, reviews, scripts and picture books, and more. Her expertise includes idea generation, concept and story development, creative direction, researching, interviewing, writing, developmental editing, copy editing, and proofing. Please see a selection of her writing below. For storytelling or writing requests, contact her here. Writer and editor for Womenwill Indonesia and other projects. Womenwill is Google's global initiative to help erase the gender gap by connecting women to the online world and tools to make the most of it. The initiative develops country specific training, events and support programs for women across the digital literacy spectrum. The Womenwill Indonesia website also features stories of women entrepreneurs, sharing their struggles and successes to inspire other women, and build community. Published online. Also translated into Bhasa. Who Ate The Cake? and Let's Play Hide-and-Seek are interactive fiction picture books for ages 4+ where the reader is the boss of the story. In both books, the reader is the main character and directs the story by making decisions about what to do next. Who Ate The Cake? has 6 different endings and takes the reader on a whimsical and imaginative adventure as they solve the mystery. 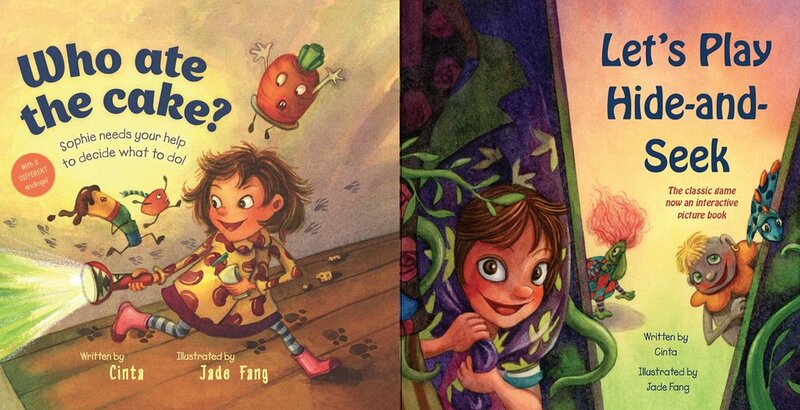 Let's Play Hide-and-Seek combines choice and chance as readers choose whether to hide or seek, and where, then roll the dice to find out if they find the teddies, or are found themselves. Associate Partner, writer, editor and producer. Be Movement is a movement that celebrates the courage to be. Through our country focussed publications, Be Movement tells the stories of courageous people, organisations and companies who are making a positive impact on the world. We also cover travel, poetry and photo essays that surprise and challenge you. Below are a selection of articles, interviews, poems and photo essays by Jacinta Plucinski from various Be Movement publications. A 5-part special on the partnership between DBS and Tate Institute of Social Sciences (TISS), and 4 social enterprises addressing higher education for the underprivileged, organic farming, waste management and rural media in India. 9 pages. Commissioned by DBS. Featuring social enterprises supported by DBS Social Enterprise Package. Published in print and online. A travel piece on the Ciudad Perdida - The Lost City in Colombia, featuring Mambo - an NGO working with indigenous tribes to develop economic strategies and Wiwa Tours - an indigenous owned operator that runs tours to the Lost City. 8 pages. Published in print and online. An interview with Michael Ginguild (Mikey) - the founder and Director of Airjaldi. Airjaldi is a social enterprise that designs, installs and operates rural broadband networks in the foothills of the Himalayas. Mikey shares his thoughts on India, working in rural development and running a social business. 6 pages. Published in print and online. A travel piece and poem on Møns Klint - a 6 km stretch of chalk cliffs along the eastern coast of the Danish island, Møns, in the Baltic Sea. 4 pages. Published in print and online. An interview with Tushar Gandhi - Gandhi's great grandson. Gandhi discusses the responsibility of his great grandfather's legacy, the passive violence of thoughts and words, and issues facing India today. An interview and thought piece with Dr. Kiyoshi Kurokawa - Chairman of Fukushima Nuclear Accident Independent Investigation Commission (NAIIC). Dr. Kurokawa shares his thoughts on what Japan and the world needs to learn from the Fukushima disaster, the importance of asking questions and where courage fits in. A candid interview with 2013 Social Entrepreneur of the Year and Table for Two founder, Masa Kogure, on taking the leap into the social enterprise sector, the lessons he’s learnt and the impact of the Great Eastern Japan Earthquake. An interview with Thomas Thomas - pioneer of corporate social responsibility in Singapore, and former executive of Singapore Compact - a CSR think tank and research organisation. Thomas talks about the 4 pillars of corporate social responsibility and how a return to CSR is a return to Asian values. 1 page. Published in print and online. Mitsuru Claire Chino is the youngest and first female executive officer of a major Japanese trading company. Midori Shimotsuma is a researcher, writer and illustrator. Minami Tsubouchi is a CEO sculpting the leaders of the future. Yuko Isoda is the Vice President of Matsushima Tourist Association and heads the largest hotel in Matsushima Bay. Here are four women in Japan shaping their own path, sharing a common courage to set their own expectations and make their own choices. We also hear how the Great East Japan Earthquake changed them. 16 pages. Published in print and online. A 6-part feature on the contribution of the Japanese Chamber of Commerce and Industry (JCCI)'s Singapore Foundation to Singapore's culture and history since the country was founded 50 years ago. 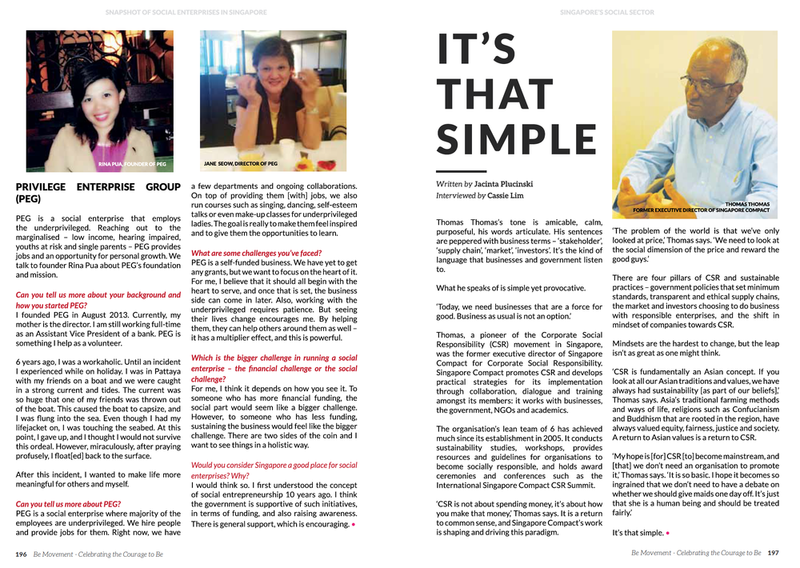 Features an interview with the JCCI president, and interviews with beneficiaries of JCCI's Singapore Foundation Scholarship. 22 pages. Commissioned by JCCI. A 10-part special on Bank of Tokyo-Mitsubishi UFJ (BTMU)'s quiet contribution to Singapore since its founding including project financing of Singapore's infrastructure, educational institutions and hospitals, as well as the bank's corporate social responsibility and outreach activities, and how it hopes to continue to support Singapore in the future. 10 pages. Commissioned by Bank of Tokyo-Mitsubishi UFJ (BTMU). 14 pages. Published in print and online. We meet with social entrepreneurs and government organisations for a round table discussion on the social enterprise landscape in Hong Kong, what they need to survive, and whether the city's financial status helps or hinders the sector. We meet with Tristan Gooley, founder of The Natural Navigation School and author of The Sunday Times bestseller, “The Walker’s Guide to Outdoor Clues & Signs”, and ask him why natural navigation is going through a revival, how to get started and how he’s navigated his own personal journey. An evocative piece on Hong Kong's feelings about the handover. A look at the business and trade ties between Japan and Hong Kong including the challenges, the cultural differences and similarities, and what the future may hold. 16 pages. Commissioned by Japanese Chamber of Commerce and Industry. Published in print and online. Away from the crowds, we set out to explore a lesser known Hong Kong, and discover the abandoned island of Yim Tin Tsai.